Peel n' Stick Phone Cards are primarily used as a sweepstake or contest for a trade show, grand opening, etc. 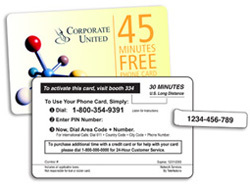 The card is a blank phone card that must be presented to your sales rep. at your booth or location in order to get a "PIN# sticker" to activate the card. They can be printed in a variety of shapes or sizes, in addition to the standard credit card size. Please contact Plastic Works to discuss other options available. Customization options such as Bar-Code, Magnetic Stripe, Variable Information, Scratch-Off Panel and Write-On Back are also available.